India's urban population is growing rapidly and is expected to reach 600 million in the next decade. Pledge: In 2015, the Indian government made a commitment to invest in 100 'smart cities' over five years. The government makes it clear there's no single definition of a smart city. But it's pledged to allocate funds to improve the quality of life in 100 selected cities, using the latest technological developments. Under the government's Smart Cities Mission, 100 cities were chosen from across the country, with the last batch only selected in 2018. When will broadband reach all villages in India? 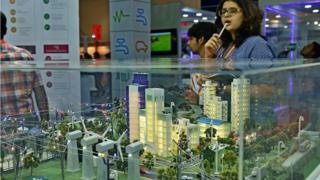 Is India building enough new houses? But in January this year, the government acknowledged that just 35.6bn rupees ($0.51bn) had been utilised - about 21% of the total. There's also been concern voiced about how the money is being used. Out of the projects approved so far, about 80% will be spent on developing areas within cities - rather than the whole city. One NGO, the Housing and Land Rights Network, has labelled the Smart Cities Mission a "smart enclave scheme". "The lack of coordination between implementing agencies is a major reason why the intended benefits are still not visible to the public," said a parliamentary committee report. The government says it has offered training courses to boost the capacity of existing local bodies - but it's not clear how successful these have been. "There has been a 479% increase in projects completed since October 2017," it told India's parliament in December. "If we have 50 of these completed by December 2019 out of the 100 required, my view is that this is one of the fastest implemented projects of this kind anywhere in the world."